Well, after more hours traveling than I care to remember, I made it to my hotel in Delhi last night [this morning, rather] at 2:00 am! I don’t think I have ever been so happy to see any human being as I was to see the gentleman from the hotel holding a sign with my name on it, waiting for me after customs in the Delhi airport. A little Hindu angel from heaven, as far as I was concerned! So, by the time I got settled and took a MUCH needed shower, I didn’t get to bed until 2:30. I decided I would just sleep until I woke up, which was right around 11:00 am [not even in my college days did I sleep until 11:00 am! ]–it felt great. After a trip to the gym, another shower, and a bit of breakfast, I was ready to go. However, I decided to take it easy today: I hired a car to take me to Agra tomorrow [the Taj! ], and it is 4 hours one way! That means we will be leaving at 6:00 am and probably not be back until 8:00 or 9:00 pm; then, I leave Delhi the following day. So, rather than cram today full, I just gave up the idea that I will be able to see much of Delhi at all, and used this afternoon to acclimate to being in India–that takes some doing. First, I found out it is pretty hard to walk around, primarily because India has the most outrageous traffic I have ever seen. 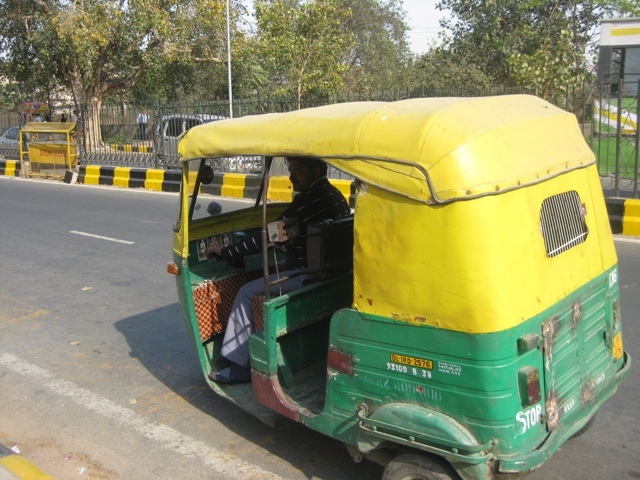 Every possible mode of conveyance is on the road at all times: pedestrians on the margins, bicycles, bicycle rickshaws, touks [see below], motorcycles, cars, etc. And, the lane-lines are little more than widely disregarded suggestions, rather than normative rules. All this makes for utter, utter chaos–plus, they drive on the left side of the road here, which means I am constantly looking in the wrong direction. I’m hoping I get the hang of that sooner rather than later, just so there will be a “later”! Did I mention that everyone honks their horn all the time, too? Luckily the touks are cheap–I road the one in the picture below out to the Sri Laxmi Narayan Temple–those are the next three pictures. 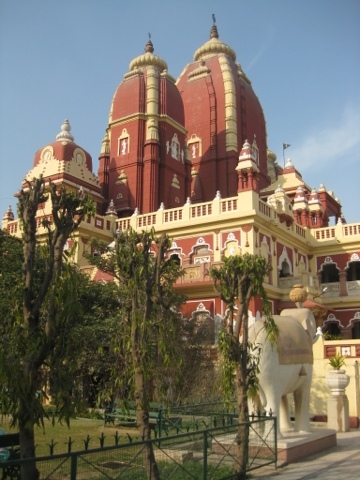 It is one of the most popular Hindu temples in Delhi: it was inaugurated by Gandhi on the condition that the temple be open to everyone, particularly dalits [those outside the caste system, sometimes referred to as “untouchables”], for prayer. 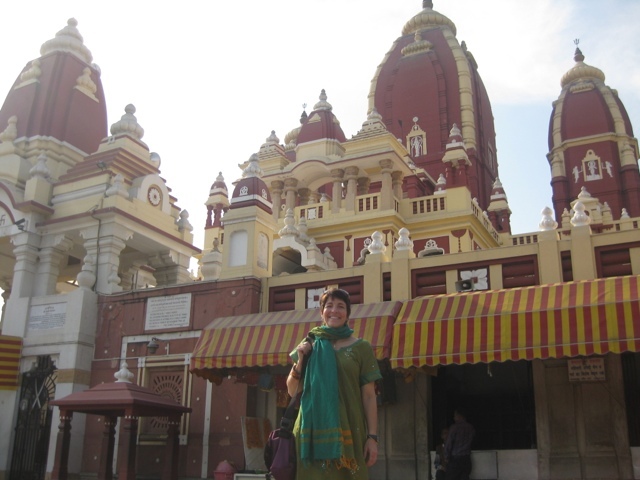 I really enjoyed walking around both the Temple itself, and the larger park complex of which it is a part. 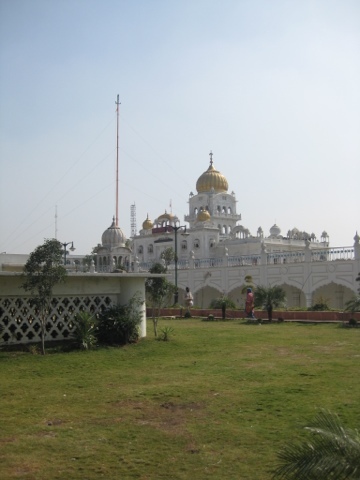 Before that, however, I went to the Gurdwara Bangla Sahib–a beautiful Sikh shrine. Those are the next pictures–the big white building. 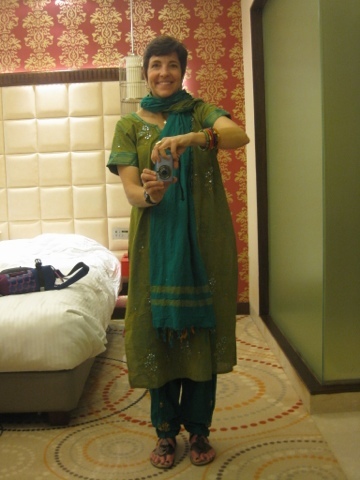 I was really glad I was wearing my shalwar kameez, a traditional form of Indian dress. I brought five of them, and they are all I plan to wear: they are great, because you don’t have to worry about modesty, and when you go to a temple, you can use the scarf as a head covering. 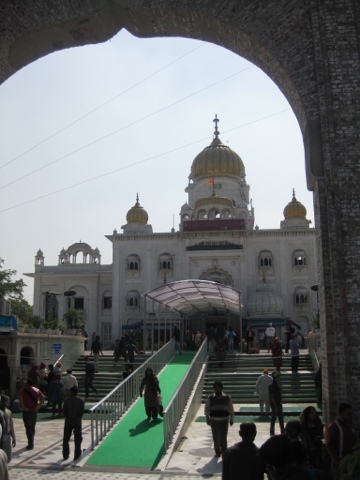 [I needed to do that at the Gurdwara–both men and women wear head coverings there.] I feel less conspicuous, too, which is nice–although I certainly can’t hide the fact that I am a foreigner! Now I am back at the hotel, getting ready for supper, and preparing for a long–but fun–day tomorrow! So glad to hear you arrived safely and soundly! Your description of the traffic reminds me of the traffic in China…terrifying to those who are unaccustomed to it, but, somehow, it seems to work perfectly fine for the residents! Every morning we would look out the window of our high-rise hotel and watch dozens upon dozens of bikers go by, weaving in and out of the rickshaws and cars…including when it was pouring rain! The only difference then was that they all had bright ponchos on.